Mid to late fall brings the first frosts for many gardeners, when growth slows and the season officially draws to a close. But lots of crops will carry on a while longer if they’re given a little protection. Use fleece, low tunnels and cold frames to offer that all-important additional warmth and shelter. Summer salads and tender plants such as cucumbers, peppers and tomatoes will continue to ripen so long as they’re protected from frost, enabling late starters to play catch up and yield a tasty harvest. Sheltered, sun-facing walls also have the effect of creating a warm microclimate that can extend these summer favourites well into autumn. When the warm weather crops are done, it’s the turn of hardy cool-season staples that were sown in summer. You may be surprised as what will grow throughout the winter: salads such as mizuna, tatsoi, endive, winter lettuce and mustards; leafy greens including chard, spinach, and the every-ready kale; plus all manner of overwintered carrots, parsnip, beetroot and leeks. Even colder climates can produce a cornucopia of pickings given the protection of a cold frame or greenhouse. Give plants plenty of space so that air can circulate and precious sunlight can reach every plant. Harvest salad crops and greens little and often, taking just a few leaves from each plant at a time so they have the energy to replace them. The springtime ‘hungry gap’ – when the previous season’s crops are finished but the current season’s aren’t yet ready – can mean scant harvests. But careful planning can ensure there’s plenty to enjoy during this traditionally lean time. Sow vegetables such as broccoli, cabbage and late-season leeks in late summer to stand over winter and join the last of the winter-stored produce such as squashes to keep the kitchen supplied. Spring is also the time to enjoy many perennial crops, including asparagus, rhubarb and intriguing rarities such as sea kale, which will set into growth far quicker than crops that have to be sown. While many salads are quick-off-the-mark from a spring sowing, more substantial vegetables such as onions, cabbage, chard and tender vegetables take a little longer to establish. You can enjoy an early start – and an earlier harvest – by sowing under cover. 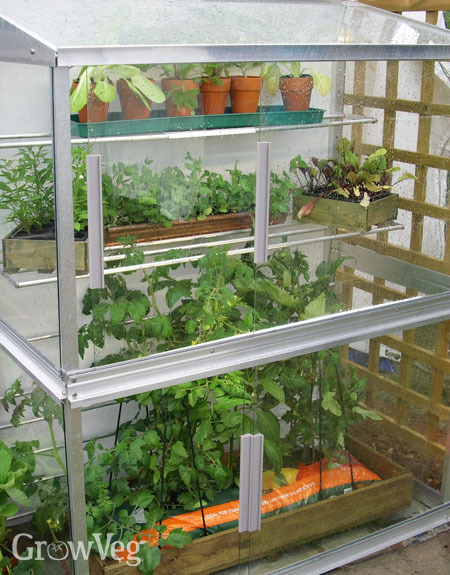 The protection of a cold frame, tunnel, greenhouse or sunny windowsill is key. Many seedlings can be started off indoors under grow lights to move to a sheltered position outside within a month or two. Onions, chard and peas may be sown into modules from late winter to transplant into beds from early spring. Others can be given a head start by pre-warming the soil with row covers or cloches. Sowings can be made directly into this pre-warmed soil two to three weeks sooner than in unprotected ground. Then from early spring it’s the turn of tender crops such as tomatoes and aubergine. Keep on sowing quick-maturing varieties little and often throughout the spring and summer to ensure a steady succession of harvests. Choose a mixture of varieties covering early, mid and late-season harvesting to maximise how long you can enjoy each vegetable. This way you could be enjoying carrots from mid spring to late winter, or strawberries from early summer, right through to autumn. When the first crops of the growing season are done, don’t hang about – sow or plant a succession crop! Planted from midsummer onwards, succession crops include many autumn and winter-maturing vegetables, including those suitable for storage such as maincrop carrots and celeriac, plus quick-growing favourites like bulb fennel and dwarf beans, which will be ready before the first frosts in many areas. It’s a good idea to have a dedicated ‘nursery’ area in a greenhouse or cold frame – or even just in a few pots kept in a sunny, sheltered spot – to enable you to raise crops from seed and have them ready to plant the moment a gap appears in the garden, so you don’t waste any of the growing season. Any year-round productive garden needs careful planning. Our Garden Planner has a number of powerful features to help you really maximise your space and your time. With your plan laid out, double-click on each crop to set the dates it will be in the ground. Then use the calendar drop-down box to view your plan during a specific month and you’ll be able to see gaps where earlier crops have been harvested. Click on the Custom Filter button (just above the SFG button to the left of the plant selection bar) and select crops suitable for sowing or planting out in July. The plant selection bar will then be filtered accordingly and it’s simply a matter of dropping in the crops you’d like to grow to follow on from those that have finished. Another handy feature is your Plant List, which takes into account how crop protection such as a row cover can affect sowing and harvesting dates – ideal for planning those late and early-season vegetables. Planning is what matters, and a little time spent working out what you can grow, and when, will yield something tasty to enjoy at any time of year. Of course, every climate brings its own challenges, so please let us know in the comments sections below how you manage to keep growing during the more difficult times of year, whether it’s in the searing heat of summer or the plunging freeze of winter.